Yes, I’ve been banging the prims together again. Since setting up my new sky house and platform, I’ve felt something has been missing. There is plenty of space, and the house I’m more than satisfied with; but something has been lacking. Daisy first partially put a finger on it, suggesting the main patio needed a few koi in a pond. She was right, but even so, things were still lacking. The pond looks a little odd, if I’m honest, and while the front lawn provided a great vantage point to watch the sun set, it lacked … something as well. It’s not often that I start tinkering without some idea of what I want; but that’s what I did yesterday; simply trying out ideas – round gazebos, additional planters, vines, simple rugs and so on. Nothing came together. It wasn’t until today that I figured out what was needed: plants, water, fish and a gazebo with room to sit and room to snuggle. I had no clear idea of how to put it all together, but I did know the front lawn area was the place. As first I thought maybe a Japanese-style area, little pools of water, plants, gravelled walkways and a small Japanese-styled gazebo. The only problem was that it really wouldn’t fit with the rest of the build’s look; I really wanted something that would continue the lines of the rest of the build, but offer rooms to sit, watch the sunset and set itself apart from the rest of the platform. 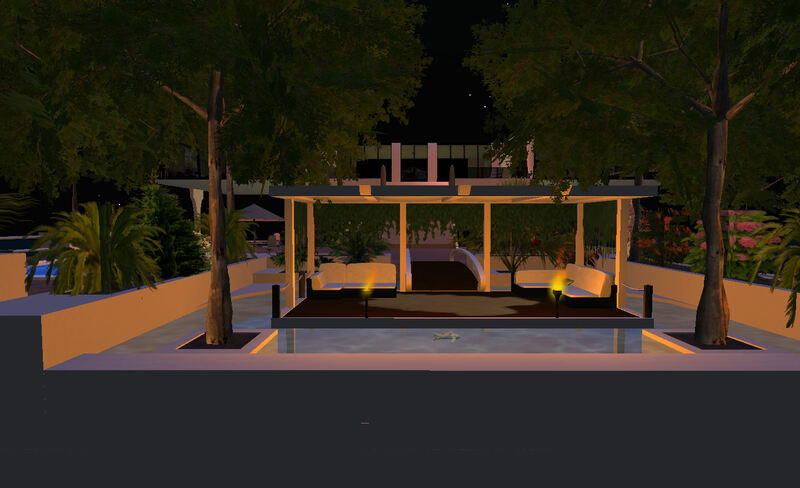 So I started with the prims and the superglue, and I’m quite pleased with the results: a clean, open-sided gazebo, draped in vines on three sides, sitting over a large pond filled with koi, with planters all around to provide a little privacy, a wooden bridge linking patio to platform. There is enough room on the platform for half-a-dozen to sit and chat, while the rug provides a nice little place for snuggles, intimate chats – and simply watching the sun set. The gazebo is currently unlit, but I’m considering a couple of hanging baskets with candles, or perhaps flames, suspended from a couple of the beams. The koi, from Jamay Greene, haven’t been used in about two years, so I guess they’re pleased to be back out of the box – although I have to admit the pond probably needs some suitable greenery to help them feel totally at home! I’ll probably tweak bits and pieces over the next day or so, but overall, I think the gazebo and bits complement the rest of the house. Now I’ll just have make sure it gets used!